We are pleased to announce that SME Association of Malaysia (SMEAM) is collaborating with Aladdin Street.com to assist SMEs venturing into e-commerce. AladdinStreet.com (http://aladdinstreet.com) is the world’s exclusive Halal e-marketplace that will open new fronts for the Halal industry offering a wide catalogue of quality HALAL products and services across all industries worldwide. AladdinStreet.Com (http://aladdinstreet.com) is a highly secure and sophisticated Business-to-Business (B2B) and Business-to-Consumers (B2C) e-marketplace that is developed exclusively for manufacturer, marketers, providers and consumers of premium HALAL products and services. 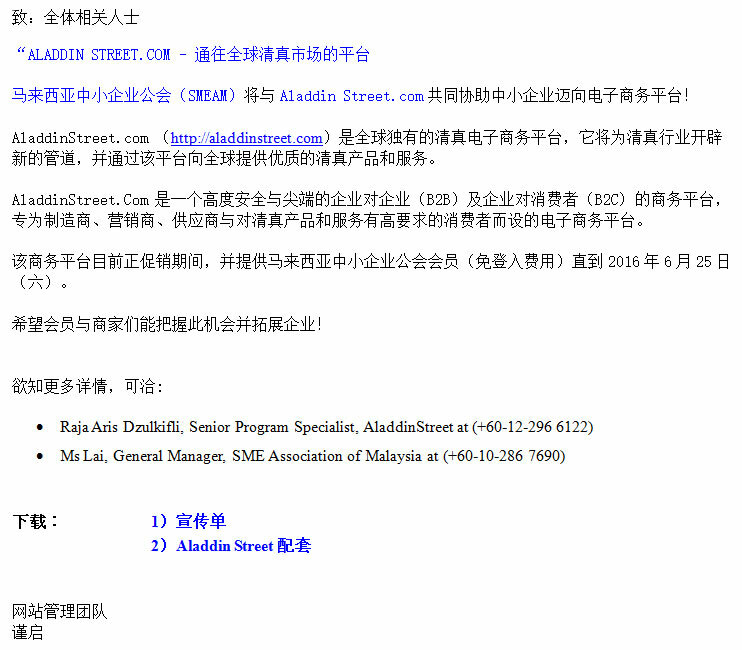 Now AladdinStreet.com is having promotional period (free listing fee) to members of SME Association of Malaysia till 25th June 2016(Saturday). You are encouraged to grab this great opportunities for your business expansion!